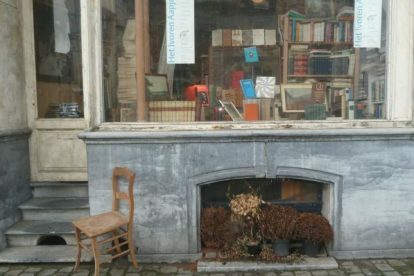 Standing on the lovely Beguinage square during daytime, there is one thing that always grabs my attention: a bunch of books lying outside on the steps of my favorite bookshop. As if there was no more room left inside for them. And that is actually the case – as you’ll find out when you step inside Het Ivoren Aapje. Along every wall, shelves with books rise up to the ceiling. A thick layer of even more books covers several tables. The rest of the collection is just piled up in stacks, one book on top of the other, like stalagmites emerging from the ground. You’ll hear some classical music in the background. Or mere silence. In this superb setting, you’ll find a sleeping dog on a sofa, as well as the dog’s owner, Frederik. The latter also happens to own the bookstore. It is bookworm Frederik who personally selects every work, guided by his own reading preferences. He can give you expert advice if you’re indecisive about what to read next. The collection contains fiction and nonfiction, has a keen selection of the wildest poets, novelists and philosophers, and is reasonably priced! You’ll find original works and translations in Dutch, English, French, German, Spanish, Italian and even Russian. All books are second-hand and often quite old. Don’t worry about dog-ears though, because you can also sometimes find a decades-old newspaper literary review or a handwritten letter from lover to lover in the book you just bought. Sounds exciting? It is.